Today it is very popular to travel to holy places in many countries of the world. There are such places in Belarus, which from time immemorial attracted believers with their spiritual power. However, this trip will be interesting not only to pilgrims, but also to ordinary tourists. With the help of our route, you will be able to touch the shrines of Belarus, to penetrate the Orthodox culture of the Belarusian people. For centuries, the holy places beckon and attract people. The sacred places of the Belarusian land that you can see here will not leave you indifferent. First of all, it is necessary to go to the ancient Belarusian city of Polotsk - the main place of pilgrimage for Christians of the entire Orthodox world. From time immemorial, Polotsk Sophia Cathedral was the religious center of Russia. This cathedral symbolized the power and independence of the Polotsk principality. St. Sophia Cathedral, built in the 11th century, was constantly decorated, destroyed and rebuilt. In the 18th century, the cathedral was completely modified and rebuilt by the Uniates. From the old building, there were only some parts of the basement, a crypt and fragments of internal pillars left. Remains of frescoes of the 11th century are preserved in the ancient part of the temple. Nowadays, a concert hall with an organ is located in the building of the St. Sophia Cathedral. Also in Polotsk is the Saint Euphrosyne convent. In winter and summer, and especially on June 5, on the feast day of St. Euphrosyne of Polotsk, people come here to bow to her relics, which are in the niche of the Savior-Transfiguration Church. And, next to it is a fresco with a holy face, which looks at us with a loving and searching look. Holy Euphrosyne of Polotsk is considered by believers as a intercessor of the Belarusian land. Every nation has a relic, which the ancestors cherished. For the Belarusians such a shrine is the Cross of Euphrosyne of Polotsk. By her order, the master jeweler Lazar Bogsha created a very beautiful six-pointed cross made of cypress wood. The cross contained pieces of wood from the cross on which Jesus Christ was crucified, the relics of the saints. Legend says that the relic was shining in the most impenetrable darkness, the sick returned health, poor and exhausted gained a hope for a better life. To see this miracle with their own eyes and to bow to it, believers came to the city on the Western Dvina. The length of the cross is 51.8 cm. The wooden base of its surface is lined with gold plates, decorated with precious stones, multi-colored enamels with images of saints. The inscription on the cross says that anyone who dares to appropriate it will be cursed by the Holy Life-Giving Trinity. But, despite the strong paternoster, the cross left the walls of Polotsk many times throughout the history. Before the Second World War, the cross was in the Mogilev Historical Museum, and then disappeared. Its fate is still unknown. 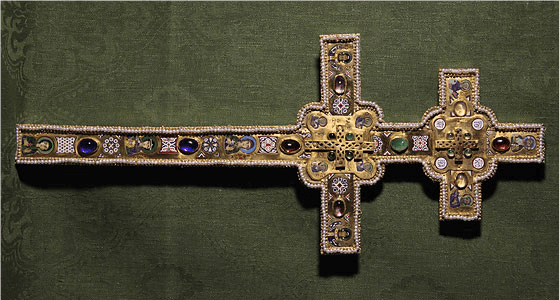 However, in 1997, a fine copy of the cross of Euphrosyne of Polotsk was created by Brest jeweler Nikolai Kuzmich. Like the original, a copy was placed in the Transfiguration Church of the Saint Euphrosyne convent. Today, believers still come to view the shrine. By car - on the road P 46. On the border with Russia, on the eastern outskirts of the country, there is a Pustynki Holy Assumption Monastery, founded in 1380 by the prince Lugven Olgerdovich at a miraculous spring. According to a legend, the blinded prince regained sight after he washed his eyes with water from a holy spring and immediately saw the icon of the Mother of God. For a long time, the monastery was abandoned, and today many of its buildings have not been restored yet. 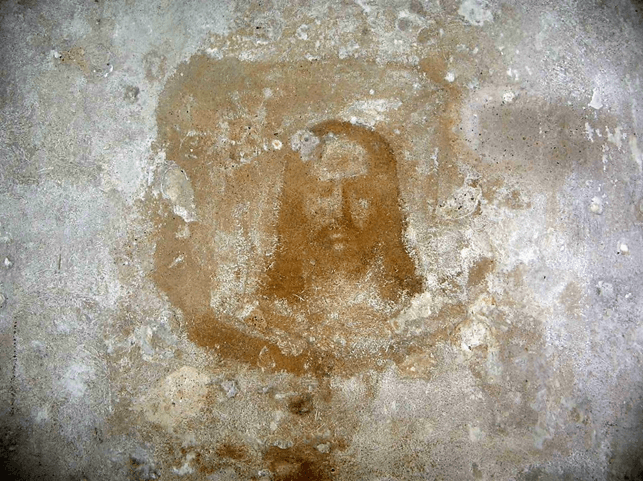 However, when the monks moved to the monastery, the face of Christ appeared on one of the walls. The monks consider this a sign sent by God to show their blessing on the revival of the monastery. Specialists studied the face and came to the conclusion: the image is really not made with hands. What you see will impress you, it is hard to imagine how this is possible. Until now, there are reconstruction works on restoration of the Holy Assumption Monastery: the bell tower, the Nativity of the Virgin church were restored. On the territory of the monastery is a font, after bathing in the holy water of which you can heal from a serious illness. Tradition says that if you enter the water three times with your head, then the font will clean not only dirt, but also diseases and sins. Especially many pilgrims are here on holy days, but also on regular days, many people want to look at the miracle - the face of Christ, to worship it. The monastery in Pustynki is impressive, it makes you feel calm. An unforgettable place to visit is not only believers, but also for ordinary tourists. How to get there: unfortunately, public transport doesn’t go to the monastery, you can only get there by car. Mstislavsky district, Mogilev region, Pustynki village (10 km from Mstislavl towards the border with the Russian Federation on the P73 road). 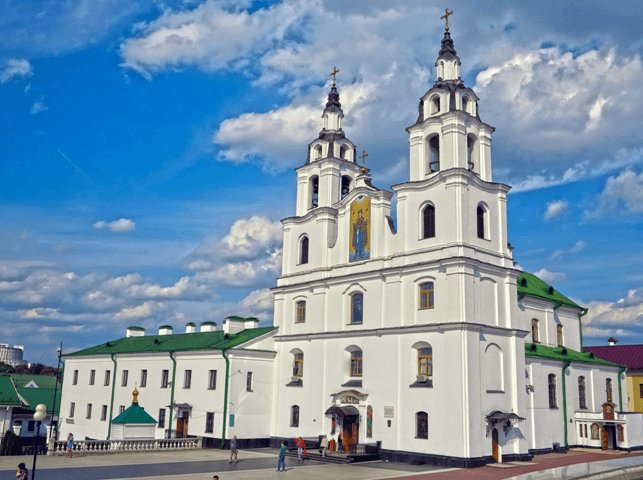 In Minsk, it is worth to visit the Holy Spirit Cathedral, which rises majestically on a hill above Svisloch, and is the main Orthodox church in Belarus, the center of the capital’s spiritual life. The cathedral impresses with its majestic beauty and unique decoration: there are a number of unique icons of the Moscow Academic School in the iconostasis. To the left of the altar, in the side niche, you can see the imperishable relics of the holy Blessed Sofia of Slutsk, which are the shrine of the cathedral. But, the most valuable relic of the cathedral is the miraculous icon of the Mother of God. It is called Minsk icon and was found by Minsk citizens in 1500. For its centuries-old history, the icon has become the protector of the townspeople of the Belarusian capital: they prayed for getting rid of the invasion of enemies, healing of diseases, the icon helped to cope with grief and temptations. 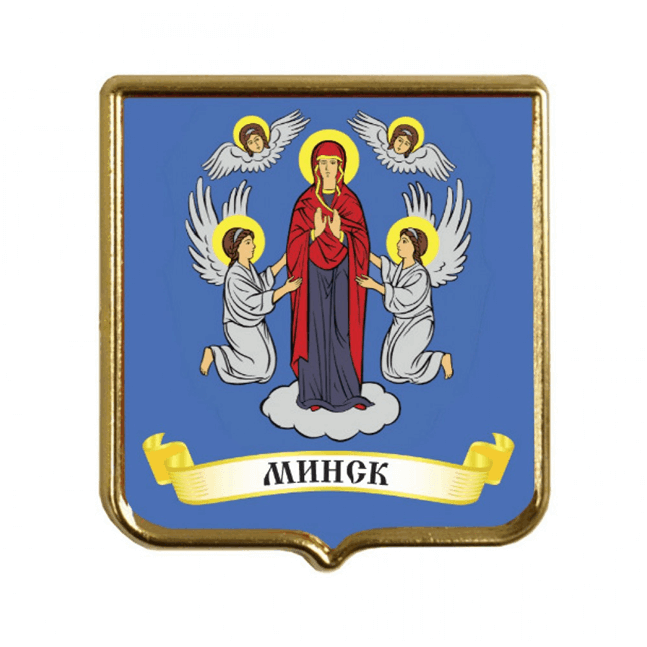 Not without reason, the image of the Virgin is placed on today's coat of arms of Minsk. How to get there: the cathedral is in the center of Minsk at Cyril and Methodius Street, 3. At the present time, the Zhirovichi Holy Assumption Monastery is the largest Orthodox monastery in Belarus. It is worth to go there: the complex makes an unforgettable impression! It admires with its beauty, old times and energy, which reigns here. Over 500 years of its existence, the Zhirovichi Holy Assumption Monastery has become the largest spiritual center of the country, historically closely connected with Orthodoxy, Catholicism and Uniatism. The monastery is also famous for the fact that in its time there existed the Lithuanian theological seminary and the Zhirovichi spiritual school. Today the Minsk Theological Seminary is located here. Many Orthodox and tourists go to Zhirovichi to worship the icon of the Mother of God. For its centuries-old history, with frequent fires in Zhirovichi, the image remained intact not only itself, but also saved the monastery building from the fire. The icon contributed to the treatment of severe patients, gave hope to the weak spirit and even saved from death. Wonderworkers came to bow to the lofty people of Rzeczpospolita and the Grand Duchy of Lithuania. Lithuanian princes and Polish kings took part in the divine services in honor of the icon of the Mother of God. Zhirovichi is still an attractive place for the pilgrimage of Christians not only from Belarus, many come here to worship the shrine. Every year on May 20 Belarusian believers celebrate the feast of the miraculous icon of the Mother of God, pray and clean themselves from the evil. 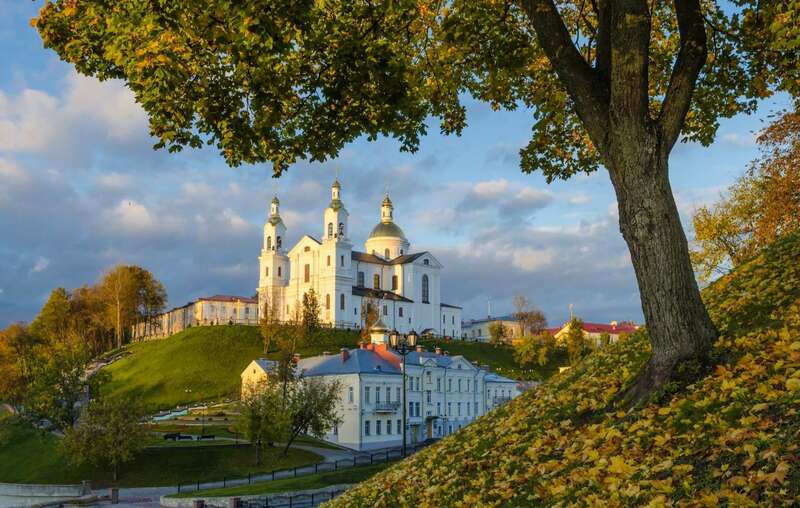 How to get there: the monastery is located 10 km from Slonim, regular buses run from the city. Slonim can be reached by a minibus from the Central Railway Station of Minsk. By car: from Minsk by M1 towards Brest, then by M11. It was our pilgrimage route through Belarus. Hopefully, it helped you to plan your religious journey through our country.